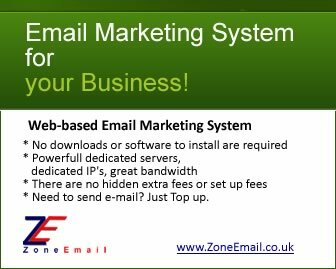 ZoneEmail Marketing Services are fast, cost effective and simple to use. Powerfull dedicated servers, dedicated IP's, great bandwidth, latest software installed. Pricing is based both on the numbers of emails to be sent and the length of the message together with discounts for larger volumes. Web-based software with clean and intuitive interface. Up to 5MB of image hosting included. Mail merge option which allows you send personalized emails to the recipients using the fields attached to your contacts. While tracking bounced emails and unsubscribes, the system also re-organizes your email lists accordingly, saving you time. View delivery, opens, bounces, and unsubscribes for each campaign. Watch how your subscribers relate theirselfs and how they react to your campaign.